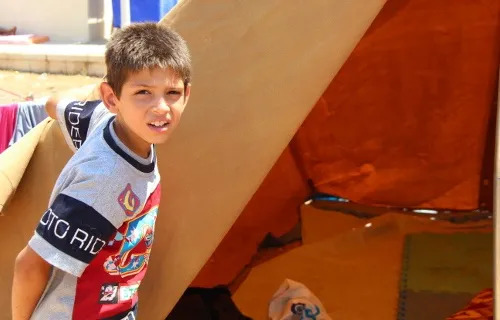 Refugee child in Ankaway, Erbil at the opening of his tent_Catholic News Agency. Credit: Maria Lozano. Washington D.C., Nov 20, 2014 / 04:41 pm (CNA/EWTN News).- The Knights of Columbus is putting more than $2 million toward new homes for Iraqi and Syrian refugees fleeing violence, and not a moment too soon, said Supreme Knight Carl Anderson. “We have tens of thousands of refugees in this area [Northern Iraq] who have been driven from their homes at the point of a gun. Many of them are sleeping outdoors, in hallways, three, four families together in a Christian school. And winter is coming,” Anderson told CNA in a Nov. 20 interview. Construction on the houses “may begin as early as next month,” the Knights of Columbus website noted. More than 100,000 Christians have fled their homes in the Mosul region of Northern Iraq after Islamic State forces drove them out in their summer offensive. Many of the inhabitants had to leave most or all of their belongings behind, and refugees are now living in tents or schools. The Church has been the sole source of aid to the refugees because the Iraqi government has done nothing, a member of the international aid group Aid to the Church in Need told CNA in October. With 1.8 million members worldwide, the Knights of Columbus is the world’s largest Catholic fraternal order. The Knights announced on Nov 19 that they would be donating over $2 million to aid Iraqi and Syrian refugees fleeing violence – and not only to Christians but other religious minorities as well. Permanent homes will be constructed in the Chaldean Catholic Archdiocese of Erbil, which lies in territory controlled by the Kurds in Northern Iraq. The Knights raised $1.7 million from individual members, local councils and other donations since August, on top of the $1 million the fund began with. Money came along with prayers for the refugees, Anderson said. The fund is still open for public donations. In addition to house funding, the Knights’ Christian Refugee Relief Fund is giving $200,000 in general aid to the Greek Melkite Catholic Archdiocese of Aleppo, Syria. Anderson emphasized that Christians have a right to live in the region they have inhabited for thousands of years. The Knights’ action is in response to Pope Francis’ call for a “globalization of charity” towards migrants worldwide, Anderson affirmed. “This is maybe the most glaring example of this crisis. It is – in many other places in the world – my experience has been people like to stay in their homes if they can. People are emigrating because it’s impossible for them to stay in their homeland. So we have to be able to find a way of solving these problems,” he said. “These new homes are signs of hope that will allow this community to begin to blossom once again,” he stated in a Nov. 19 statement.